Building a new class organization is hard work under the best of circumstances, but when a new boat can cost a couple million and the owners are used to getting their way in big business, fostering a congenial fleet atmosphere would seem to be a challenge. 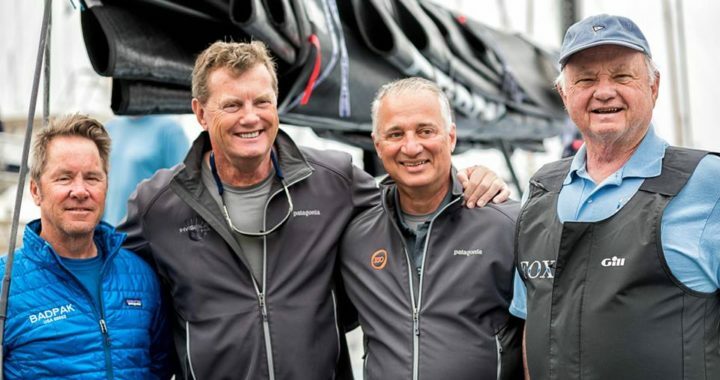 Taking on this challenge is the new Pac52 class which has four boats – three new in 2017 – that are working together to promote and encourage Pac52 class racing. Based on the TP52 class design with some tweaks, the fleet got its first trial at the Yachting Cup in San Diego, CA. Manouch Moshayedi and his Rio team won the inaugural event and shares some insight into the class. I used to have a TP52 that I’d raced so I was familiar with the boat and I’ve known Victor Wild for quite a few years through racing. We became friends and he asked me about buying a second-hand TP52. I got Gavin Brady involved and we sat down, talked about it, and Victor decided he wanted to build a brand new one. So he built Fox, and then I talked to Norm Davant who is the captain for Invisible Hand, and he talked to Frank Slootman and he agreed to build one. And then we called up Tom Holthus to see if he wanted to join in. Tom had just donated his STP65 at that time and he was looking to buy a new boat. So we all decided to build three new boats. That’s how the class came about. We absolutely want to make this class work, and we want to try to attract more buyers of this sort of thing. There are quite a few TP52s that are currently for sale and I think in 2018, because of the new rules that class will be adopting, there’ll be probably five or six of those boats that will come up for sale. All these TP52s can be very easily adapted to conform to the Pac52 class rules. My boat is essentially what is being raced in the 52 SUPER SERIES but with a taller mast. That’s it. So with a used TP52, if you donate the mast and sails, there’s enough of a write-off to buy a new taller mast and sails. So I think it’s very doable and it’s the easiest thing to do. The moulds are there to build a new boat, but with the strong used boat market, a new owner can probably get in at 50% of what it costs us to get here. And the boat is great too. I love this boat. Pound for pound, they’re the most exciting boats out there today. Here we are in San Diego, we got some breeze and we’re going 22, 23 knots downwind. That is really exciting stuff. You don’t see that a lot. As we sail against each other in equal boats for a period of time, everybody will know how to work with their boats better, and become more in-line with the level of clean play seen at the 52 SUPER SERIES. I think we still have those tweaks to work out, but as long as we don’t kill each other until then, I think we will be fine. UPDATE: Gavin Brady just confirmed with the Pac52 Class that the Beau Geste Pac52 will attend the 2017 Rolex Big Boat Series and Pac52 Cup at St. Francis Yacht Club in September. Beau Geste is owned by Karl Kwok of Royal Hong Kong Yacht Club. The Yacht was designed by Botin and was built at Cookson Boats in 2016 next to her sistership Fox. Beau Geste will join the four other Pac52s Fox, Invisible Hand, BadPak and Rio at the regattas in the fall. Posted in Rio 52 News.